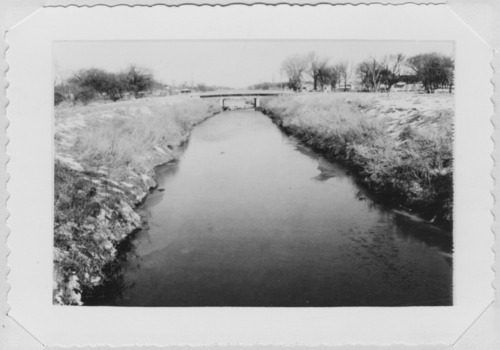 Two photographs of a drainage canal in Wichita, Kansas. One photograph shows the canal looking upstream from the Ninth street bridge and the other looking upstream from the Lincoln street bridge. The photographs were removed from a United States Department of the Interior Geological Survey, Wichita Drainage Canal, Kansas, April, 1959, publication.